The Buenos Aires VAAC reported that only gas and steam rose from Antuco on 20 April; although a pilot reported ash emissions, ash was not identified in satellite imagery or by web camera during clear skies. During a February overflight, fumarolic activity was visible in the small scoria cone nested within the main crater. 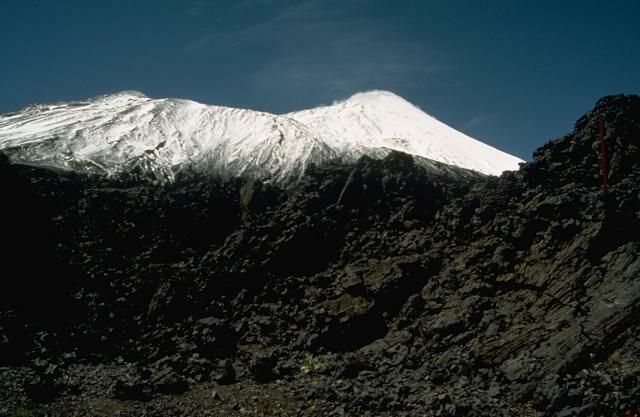 Weak summit fumaroles had previously been observed during visits in 1969, 1982, and March 1984. Fumarolic activity has apparently been continuous, but of variable intensity, from the cone since the volcano's last eruption in 1869. Lava flows from Antuco dammed Laja Lake's outlet in 1853, causing the water level to rise around 20 m.
Information Contacts: H. Moreno, SAVO, Temuco. 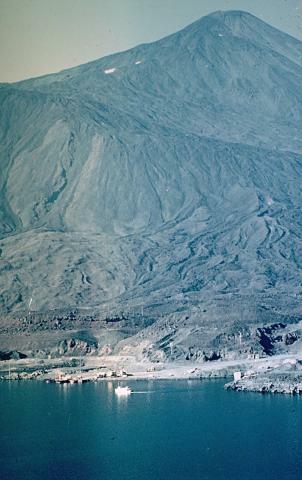 Antuco volcano, constructed to the NE of the Pleistocene Sierra Velluda stratovolcano, rises dramatically above the SW shore of Laguna de la Laja. Antuco has a complicated history beginning with construction of the basaltic-to-andesitic Sierra Velluda and Cerro Condor stratovolcanoes of Pliocene-Pleistocene age. Construction of the Antuco I volcano was followed by edifice failure at the beginning of the Holocene that produced a large debris avalanche which traveled down the Río Laja to the west and left a large 5-km-wide horseshoe-shaped caldera breached to the west. The steep-sided modern basaltic-to-andesitic cone of has grown 1000 m since then; flank fissures and cones have also been active. Moderate explosive eruptions were recorded in the 18th and 19th centuries from both summit and flank vents, and historical lava flows have traveled into the Río Laja drainage. Lopez-Escobar L, Vergara M, Frey F A, 1981. Petrology and geochemistry of lavas from Antuco volcano, a basaltic volcano of the southern Andes (37° 25' S). J. Volcanol. Geotherm. Res., 11: 329-352. There is no Deformation History data available for Antuco. There is no Emissions History data available for Antuco. Antuco volcano rises dramatically above the shores of Laguna de la Laja. Edifice failure at the beginning of the Holocene created a large horseshoe-shaped caldera whose NW rim forms the ridge descending diagonally across the photo to the right. The steep-sided modern basaltic cone has grown 1000 m since then, producing fresh-looking lava flows with prominent levees that have overtopped the caldera rim and reached the lake shore in the foreground. The most recent eruptions of Antuco occurred during the 18th and 19th centuries. Antuco volcano, seen here from the NW, has a complicated history beginning with construction of an andesitic stratovolcano during the Pleistocene. Edifice failure at the beginning of the Holocene produced a large debris avalanche that traveled down the Río Laja to the west. The collapse left a large horseshoe-shaped caldera whose NW rim forms the ridge descending to the right. The steep-sided modern basaltic cone (upper right) has grown 1000 m since then. Moderate explosive eruptions were recorded in the 18th and 19th centuries. 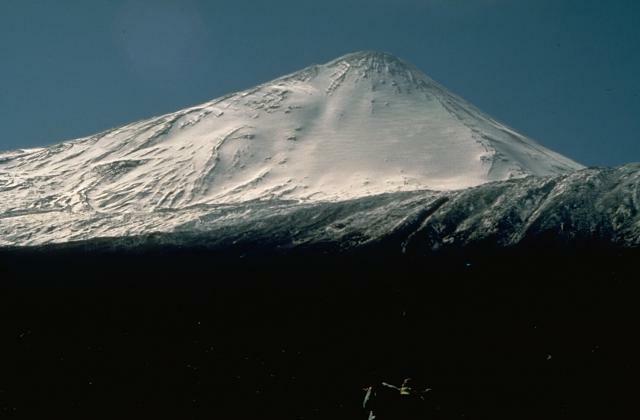 The snow-capped modern summit of 2979-m-high Antuco volcano rises above the rim of a large horseshoe-shaped caldera, whose WNW rim forms the flat ridge just above the snow line. The caldera was formed by collapse of an older Antuco volcano at the beginning of the Holocene. The 1-km-high modern cone subsequently grew at the head of the scarp. Eruptions from both summit and flank vents have occurred during the 19th and 20th centuries. There are no samples for Antuco in the Smithsonian's NMNH Department of Mineral Sciences Rock and Ore collection. Large Eruptions of Antuco Information about large Quaternary eruptions (VEI >= 4) is cataloged in the Large Magnitude Explosive Volcanic Eruptions (LaMEVE) database of the Volcano Global Risk Identification and Analysis Project (VOGRIPA).